"I feel very blessed for where I am." 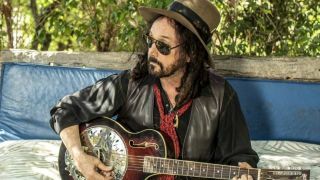 In an exclusive interview, Mike Campbell discusses his new role in Fleetwood Mac, and the loss of his dear friend and musical partner, Tom Petty. Watch Kurt Vile Perform a Stripped-Down Cover of Tom Petty's "Learning to Fly"
Vile also played his own "Bassackwards" at the Sirius XMU session. The new release collects tracks from the Heartbreakers, Mudcrutch and solo career. "American Girl," the second single offTom Petty and the Heartbreakers' 1977 self-titled debut album, has pretty much got it all. Watch a Catholic Priest Shred Tom Petty's "Runnin' Down a Dream"
Last winter, after watching the excellent 2007 documentaryTom Petty and theHeartbreakers: Runnin' Down a DreamonNetflix, I decided it was finally time to see Tom Petty in concert. Tom Petty's death is a shocking reminder that people and things that we consider "constants" can disappear in an instant—and there's nothing we can do about it. The shocking news of Tom Petty's death late Monday night reverberated around the world, causing a wave of tributes from guitarists and musicians from across the musicial spectrum. Tom Petty has died at the age of 66 after being found in full cardiac arrest at his Malibu home Sunday night. The singer was rushed to UCLA Medical Center, but could not be revived. Tom Petty and the Heartbreakers have announced the first dates of their 40th Anniversary Tour. For the third time in a month, the gang at Danelectro has listed artist-autographed Danelectro guitars on eBay — with all proceeds going to a good cause.